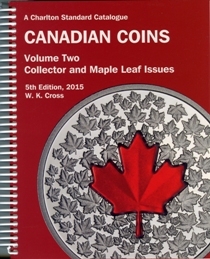 Actual size of book - H 9" x W 7"
"The fifth edition of Canadian Coins, Volume 2, Collector and Maple Leaf Issues is the only authorative catalogue on the Royal Canadian Mint collector issues on the market today. The 5th edition which lists the most current and up-to-date listing of bullion Maple Leaf issues, was released at the Royal Canadian Numismatic Convention in August 2014. Over 250 new issues of collector and maple leaf coins have been released from May 2013 to April 2014. All the new released coins are recorded in the revised 5th edition of Canadian Coins, Volume Two which is available now. The $20 for $20 series continues with the addition of four new designs for 2014. The series will now contain fourteen coins illustrating Iconic Canadian scenes. In 2014 the Royal Canadian Mint added two new series, the $50 for $50 and the $100 for $100. The $50 series currently has only one coin, the $100 series has four new designs. Aboriginal Cultures are being commemorated in several new series, the first being the Legend of Nanaboozhoo, a hero who is able to take many different shapes. Besides varying designs within the series the Royal Canadian Mint now offers different compositions from silver and gold to platinum. In the Maple Leaf section two new units have been added; a one-and-a-half ounce commemorating Canada's Arctic animals and a five kilo commemorating great Canadian artists. These two new units open up the maple product line for new designs. The fifth edition is a must for the collector tracking mint and bullion issues." This is the most comprehensive guide to Canadian Collector Coins!